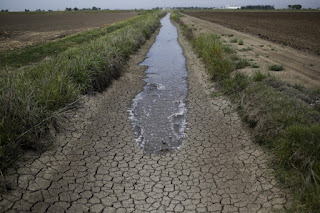 There is a drought crisis happening right now in California that is having a direct affect on the rich food life that we - and I mean every one of us in North America, has taken for granted. The drought is having a direct, negative impact on the agricultural practices of foods we've come to enjoy and rely on. It is also effecting our ability to create and replicate recipes that use these particular foods. Now, more than ever, there is a real need to make serious changes to what we, in the food and culinary world deem "recipe-friendly" to the masses. This is an outright call for change in order to get people to start thinking about using ingredients that are truly local, seasonal and just plain better for our environmental health and survival. California has been in the news a great deal this past year. The television program 60 minutes recently featured an in-depth report on the state's water shortage. The New York Times also did a feature about the same issue. The mainstream media's extensive coverage of this story may be recent news for the rest of the world, but the water shortage, and the dilemma of how to deal with it has been an ongoing issue for California politicians and citizens for over four years. The reason it is seriously becoming the topic of many and not just for California citizens is very clear. The rain shortage is happening in what is perhaps the most important agricultural region in North America. The concern is real, and the solutions to solve it are causing additional environmental problems and grievances within the California farming community. California is the state where a number of popular foods originate. Produce such as almonds, strawberries, avocados, lemons, limes, and cherries - to name a few, all hail from this region. All these foods are available to consumers all year, all the time. According to the report in the New York Times, approximately 80% of all water usage in the state of California does not go towards the swimming pools, lawns or even something that is actually needed like the drinking water of the population. Instead, that water usage is for agriculture. The water usage rate, in relation to what is currently available thanks to the drought, is at such a high, almost alarming level, that farmers are currently hiring well diggers to drain underground water tables in order to feed the insatiable appetites of almond trees, livestock ranches and other water-guzzling agricultural activities. This is creating a negative environmental and social domino effect whose impact is only now being seen and felt. What is happening in California is distressing. The water crisis occurring within that state, like or not, has a direct impact on what we - within the food industry, can create and bring to people. Whether it's in restaurants, grocery stores or personal kitchens, what's happening in California affects the job we have to do. We, and that means everyone in the food industry, has a duty to raise the profile of this issue. Food industry practitioners have to make it crystal clear, that our insatiable demand for vegetables and fruits to be available year round is unsustainable. It is having a disastrous effect on our planet, not just on an environmental level, but also an economic and a basic human survival level. It is also incumbent on the food industry to not only create recipes that are seasonal, but to also drastically push the "only seasonal" message on to consumers. We have a responsibility to change the attitudes of the world. It only takes a little movement to push a boulder. Yes, the push for seasonal foods is happening and has been for a while now. But the urgency to be vigilant about this issue is moving from "lets have a campaign", to "lets create a serious crackdown plan" on what we recommend people create for sustenance, for living, and yes, for enjoyment. No one likes to be told what to do, but an exception needs to be made in this case. The push for recipe redux time may not and should not be an idea that will die when a new issue arises. It's time to make a change. Now. For our health and survival. 'Seasonal' needs to be the word for life, from this point forward. And for this blog, it starts now.